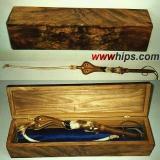 This Mongolian riding whip comes in a beautiful laquered presentation box with nice inlays. The whip is placed in a velvet-covered inlay to keep it in shape. This may have been a present for some official, as it is too precious to be a souvenir item. Unfortunately the seller didn´t have informations on the whip´s history, only that its last owner lived in England. Obviously the whip has never been used.